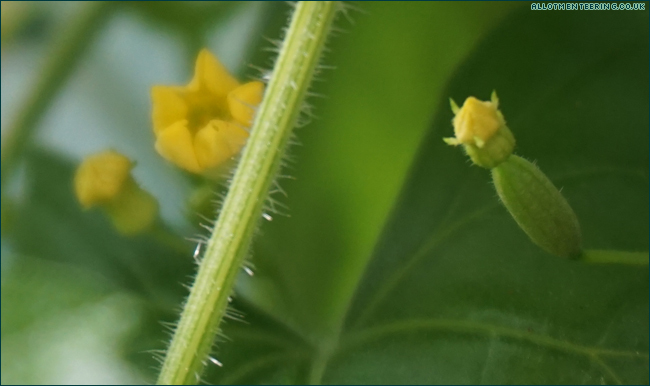 Ok, I will admit this is kind of bending the Six on Saturday rules – rather than 6 things in the garden at the moment, I’ve gone for 6 stages of cucamelons seeing as it’s the first year I’ve tried growing them. 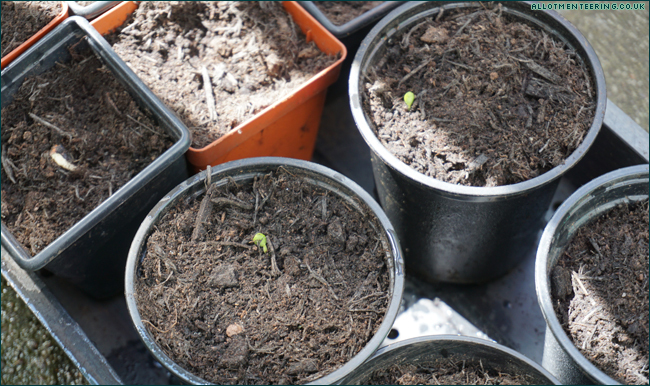 Unknown to us, the seedlings will go through periods of growth, then stop for a while. 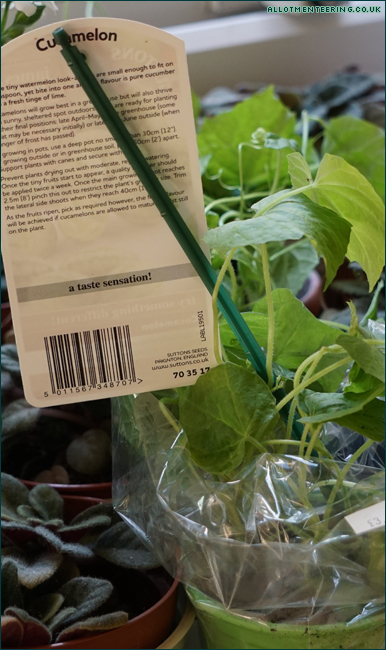 Frustrated with the lack of growth from the seedlings, we decided to ‘cheat’ and buy a Cucamelon plant. 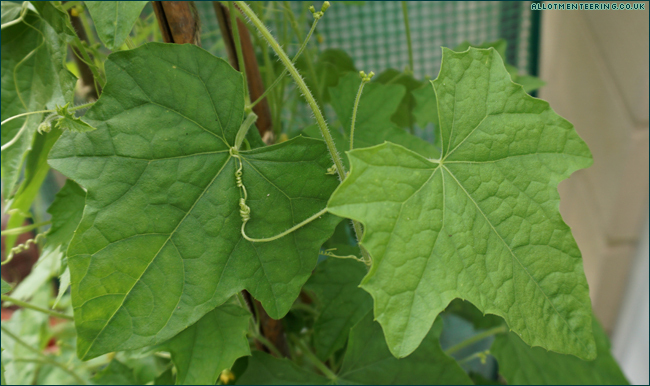 The ‘cheating Cucamelon’ was split – one plant from the pot went down to the allotment, and the other was put in a pot in the garden. 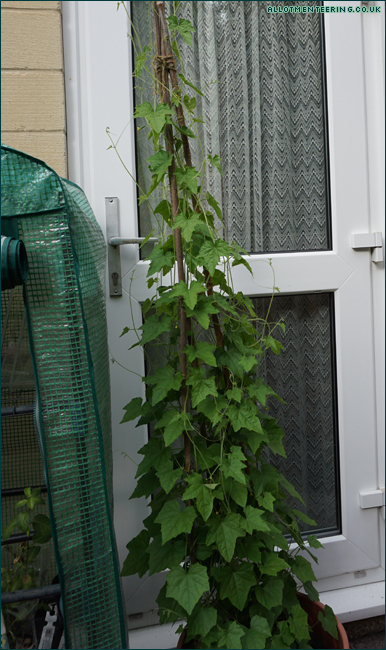 The 6′ canes seemed excessive given the size of the plant initially, but it’s now taller than the canes! 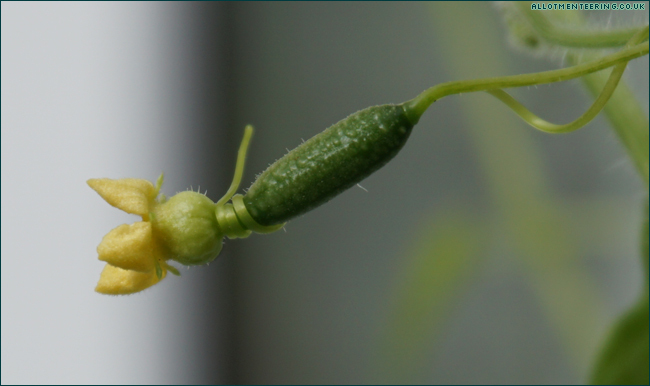 A relative offered to tie the cucamelon to the canes, but with these long tendrils there’s no real need – I nudged the stem towards the cane and it just seemed to latch on easily. 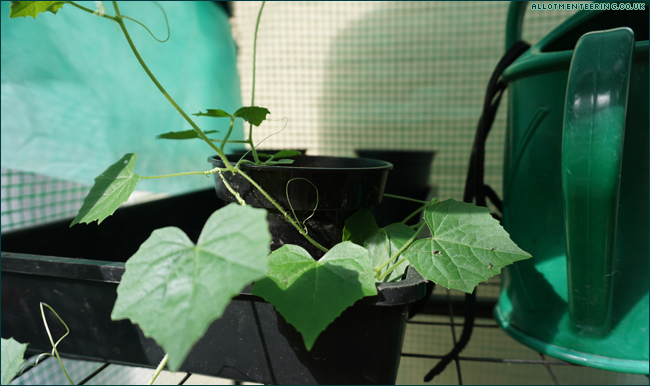 ….and quite a few cucamelons forming now as well! They’re not big enough to harvest yet, but it’ll be interesting to see what they’re like. 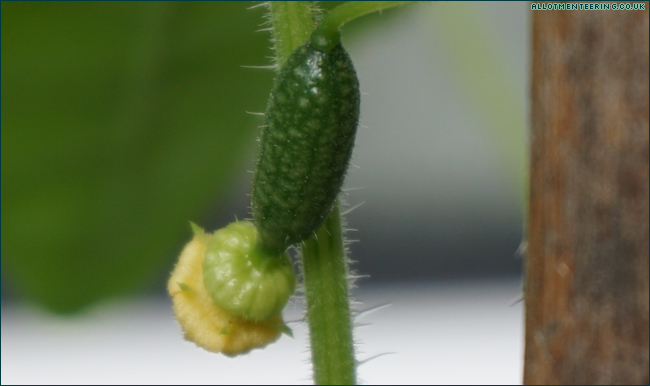 And of course now the ‘cheating Cucamelon’ is getting on so well, the seedling is growing strongly (although it’s got a long way to go before it reached the height of the ‘cheating Cucamelon’. This one will be put into a larger pot this week hopefully. I like the cucamelon story. Nice to see something from start to almost finish. We just need to know what they taste like. That’s not at all cheating. So many of us have tried cucumelon for the first time this summer that we’re all interested in the various stages of everyone else’s. Your cheat plant is much fuller than my guys, or maybe it’s cuz mine grow up a trellis . . . no, I think yours are fuller, but I’ve been eating fruit for a few weeks now. Funny old things, these cucumelons. I like them & will do it again next year. Can’t wait to see if you like them, too. Will warn you that several of us have had to use trial & error to figure out when they taste best for harvesting. I think a lot of it has to do with how it’s wound itself up a wigwam of canes – the fruits are lurking right in the middle at the moment, which is going to make picking a bit more ‘interesting’! I think I’ll pick a few of varying sizes just to see which size has the best flavour… the plant label just said “tastes best when allowed to mature on the plant” but it didn’t give any indication of how to know when they’re actually ready to pick!